The thing is, good stories don't just have one plot line or one thread of tension. Good stories have a main plot that covers the length of the book, but there are usually multiple layers of tension within that plot, and subplots too. Those layers can zip in and out of your story, get resolved quickly or last the whole novel. By graphing all the layers, you can see exactly where things are going wrong (or right!) in your writing, and you should get some ideas on how to fix them. 1. Go through your story and list all the threads of tension as you come across them, both action-based (Will X defuse the bomb in time?) and character-based (Will X's relationship with her sister improve?). As long as the reader's worrying about it or rooting for it, write it down. 3. For every tension thread, assign a number from 1-10 (1 = low tension, 10 = high) for each chapter that it features in. Some threads might last a whole novel, some might last only one chapter. For example, a low-tension thread that runs from chapter 4 to 6, might be a 2 in chapter 4, a 3 in chapters 5 and 6, then get resolved and drop out of the story. A higher-tension thread might not necessarily run any shorter or longer, but would score higher-ratings. 4. Create a graph of your table. Gawp at all those messy lines. Here's what mine looked like. 5. Now, add a "Total" column in your table and sum the tensions for each chapter. 6. Graph this again and you'll see a total tension line. 7. Analyse. Look at your total tension line first. 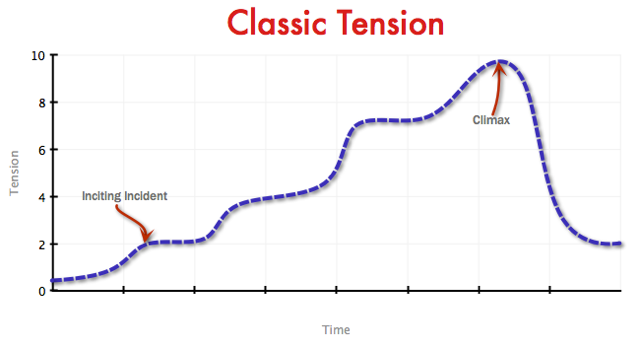 Compare it to the 'classic' tension graph at the top, so you can see potential areas of weakness in your story. (My WIP obviously has a lot of areas of weakness!) Keep in mind, there are plenty of stories that don't strictly follow the classic tension graph. 8. Looking at your graph, consider how to fix your story's problems. * Can you 'stretch' any tension threads, e.g. ones which are resolved too fast, to fill sparse areas? * Can you shift tension threads around, e.g. bring a subplot in earlier or later? * Can you tie short, episodic tensions together, or replace them with a longer thread that connects better to the rest of your plot? * Do you need to add new threads? * Are there tensions which need raising or lowering? 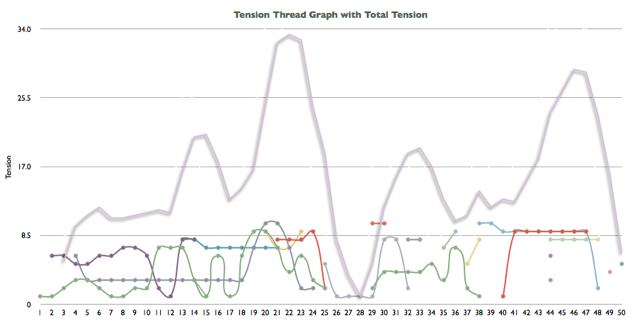 These are just a few examples, but hopefully you can see how putting a little time into creating a graph of the tension threads in your story can help you diagnose quickly where things have gone wrong, and give you some ideas on how to fix them. Have you ever used a graph to analyse your writing? Kendra Leighton is a YA author based in the UK. She's also a chocolatier, which leads to very bad food choices when writing. Her debut novel, GLIMPSE, a Gothic romance, will be published in Fall 2014. Have a guest post you'd like to submit to YA Highway? Click here and let us know what you're thinking! This post just saved me. Started revising last night, and this will be a HUGE help. Thanks for the great tips! Yay! Hope it helps. Good luck with revisions. I just tried this. It was awesome! I was quickly able to see how I'm following (or not following, as the case may be) the classic structure. The graph makes my story all the more real to me. Thanks for sharing! Thanks! That makes me happy to hear.